A telephone interview is an interview for employment conducted on the phone. Telephone interviews are often used to screen candidates in order to narrow the pool of applicants who will be invited for in-person interviews. 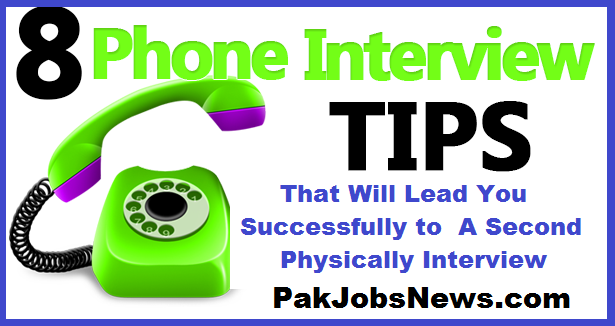 It is Your Screen Interview, After Success of This Interview They Will Call you For Your Physically interview. So take it Seriously . You Should be Completely Ready to attend the Telephonic interview, Its means you should know the time and date in your mind. Make Sure that you are Alone , nobody in your room. Turn off the TV, Radio and other things which can make Disturbance. Before interview you Should Research on it , You should know about the company, Their Business Nature, your Job Post Responsibilities which you have Applied. Carefully Listen the Telephonic interview. Make sure you breathe and speak clearly. They will Also Judge your Listening and Conversation Power on Telephonic interview. Most importantly, they might not be able to see it, but your tone of voice will reflect it. Like all good interviews, it’s not just about answering questions, but asking the right ones as well. The right questions not only help you get information you might need to make an informed decision regarding the job, but it also helps confirm your qualifications as the ideal candidate for the position. Take a little Rest (or a breath) during the interviewer asking you a question and when you start answering it. Sometimes people ask questions but then continue to talk rather than waiting for you to answer. Take your time and pronounce your words clearly. Speak slowly enough to be understood. You should be ready for telephonic interview and also keeps in mind all those Question which may be asked during Telephonic interview. these are the most telephonic interview questions Following. 1. Are you willing to Join this job ? 2. Will you travel for this job ? 3. What interests you about this job ? 4. If you were hired, how soon can you start ? Commonly Said ! That First impression is the Last impression. After Receiving the Telephonic interview , You should send them A Thank You Email, For Conducting that interview. If you done this tip they will prefer you Because its show your interest in Offer job Post. in that way they will Prefer you.